First woman to lead the NBA Players Association: How the NBA became a champion of women in pro sports. Why is men’s basketball so good at promoting women? 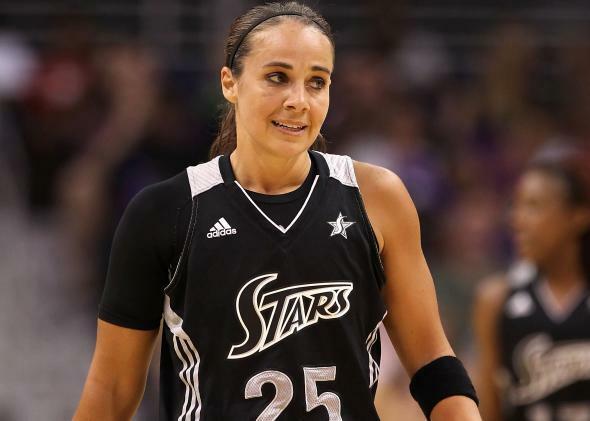 The Spurs signed WNBA player Becky Hammon (above in 2011) to serve as an assistant coach during the team’s regular season. When it comes to women in professional sports, the NBA often seems to be the only men’s league eager to make historic choices. In 1997, the NBA signed referees Violet Palmer and Dee Kantner, making them the NBA’s first female refs and the first women to officiate at the highest level of any American men’s sport. Last week, Palmer publicly came out—also a historic first. Meanwhile, Major League Baseball has dillydallied over hiring female umpires for years, but has still never lifted a female ump above the Double-A level. And though Shannon Eastin became the first female referee to don stripes at an NFL game during the 2012 lockout, the league has yet to install a woman on the field on a permanent basis. The NBA’s elevation of female coaches is similarly unparalleled. In 2001, Stephanie Ready became the first woman to coach a men’s basketball team at the professional level, serving as an assistant coach of the NBA Development League team the Greenville Groove. In 2010, Nancy Lieberman took the reins of the Dallas Mavericks’ D-League affiliate, the Texas Legends, and became America’s first professional female head coach of a men’s sport. (Lieberman was also the first woman to go pro in a men’s basketball league, when, in 1986, she joined the United States Basketball League as a backup point guard.) In 2001, Lisa Boyer ​became the first woman to serve as an assistant coach in the NBA proper, when the Cleveland Cavaliers enlisted her for one season. This summer, a woman returned to the bench when Natalie Nakase joined the Clippers as an assistant coach for the team’s Summer League games. * Elsewhere, Nicole Kirnan made history last year when she coached the New York minor league hockey team the Thousand Islands Privateers—but she only lasted five games. Update, Aug. 5, 2014: 1:30 p.m.: The Spurs have now signed​ WNBA player Becky Hammon to serve as an assistant coach during the team’s regular season—this is officially a monumental summer for women in the NBA. Where other sports have allowed for the rare exception, basketball has been concertedly building a trend. Nakase is open about aspiring to coach an NBA team of her own someday, but the NBA hasn’t just waited around for the rare woman like her to materialize; it actively recruits women who have never dreamed of making it into the league. Palmer says that when she got the call to officiate in the NBA, she “thought it was a prank”; hiring Lieberman was Legends owner Donnie Nelson’s idea. And the NBA’s commitment to hiring women doesn’t end with a few high-profile standouts. In June, the Institute for Ethics and Diversity in Sport released its annual scorecard rating major professional sports on their commitment to racial and gender diversity in hiring. * The NBA received a B-plus grade for its gender hiring practices; in its league office, 40 percent of employees are female. (One of them is Kathy Behrens, the NBA’s executive vice president of social responsibility, who Forbes once called “the most powerful woman in sports.”) It’s not perfect, but compared to the limp competition, it’s a triumph: The MLB received a C-plus in gender diversity this year; the NFL rated a C on its most recent report card. NBA teams even pay their dancers better. Lacy T., the cheerleader who sued the Raiders over scandalously low pay, was inspired to take action partly because she had previously earned above minimum wage as a dancer for the Golden State Warriors. The NBA hasn’t just benefitted from a big pool of potential female employees—it’s poured a lot of money into building them up. In 1990, the Women’s Basketball Coaches Association—a group that includes female coaches from the junior high to the Olympic level—found itself without a sponsor for the annual party it throws in concert with the NCAA Women’s Final Four. Val Ackerman, then working as an attorney for the NBA, helped convince the league to sponsor the event, and as ESPNW’s Mechelle Voepel reports, women in the sport responded with an outpouring of gratitude to the NBA. But instead of patting himself on the back, commissioner David Stern considered the benefits of connecting further with female basketball players and fans. In 1996, Stern oversaw the creation of the WNBA, convinced NBA team owners to invest money in sister teams, and installed Ackerman as the WNBA’s first president. “Nobody else in any league even thought of doing anything like that,” Lapchick says. The NBA’s commitment to women may be an outgrowth of its investment in diversity more generally. “I tell these guys we have more in common than you think,” Lieberman told The New Yorker of how she relates to male basketball players. “Young black men don’t want to be profiled, and old white women don’t want to be profiled.” More to the point: The NBA has more Democratic fans than any other sports league, excepting the WNBA. It boasts the highest black television viewership of any professional sport, employs the bulk of the highest paid, highest profile black athletes in the world, and routinely outplays the other sports on TIDES’s scorecard for racial diversity in hiring (this year, it earned an A-plus grade). The NBA was home to the first black owner of any major professional sports team (the Charlotte Bobcats’ Robert L. Johnson) and now hosts the only black principal owner in any league (the Charlotte Hornets’ Michael Jordan). And this April, the NBA’s swift unseating of Clippers owner Donald Sterling confirmed the extent to which the league’s (mostly white) team owners are responsible to their (mostly black) players. And yet, in the other leagues, commitment to racial and gender diversity don’t go hand in hand: The NFL and the MLB both routinely pull A scores on TIDES’s racial hiring metric. The pressure on sports leagues to hire and employ racially diverse employees is an imperative that hits close to home on the court and in the clubhouse. But in men’s sports, the social pressure to hire women does not exist. “When I talk to college athletic directors, and ask them if they’d ever hire a female coach for a men’s team, they give me a quizzical look at the fact that I would even ask that question,” Lapchick told me. Val Ackerman said this year that the WNBA owes its existence to former commissioner Stern’s worldview, which considered “sports and society” as “intertwined.” But Stern’s real success was in translating that moral imperative into a business imperative that would support NBA owners’ bottom lines. One obvious benefit of opening up the hiring field to women is that you get a more competitive crop of candidates. “Stern tried very hard to get the best people, no matter what they look like, where they come from, or what they believe in,” Lapchick told me. And in 2006, Stern argued that the NBA had a specific “strategic reason to support the WNBA, which is the growth of viewership and fans for basketball.” He noted that that year, the NBA finals witnessed a “double-digit increase” in the percentage of women ages 18-34 who tuned into the games.